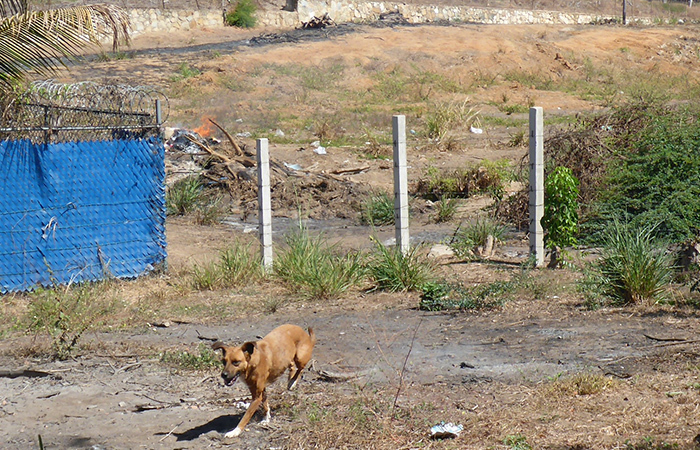 Perros en Puerto must relocate urgently! The situation has been critical for quite some time but without secure land, funding and resources, a proper permanent shelter was never an option. Then, in November 2016, a very generous Canadian couple from Edmonton, Alberta gave PEP a large piece of property, in an ideal location, upon which to finally build a safe and permanent home for the dogs! The new shelter has been designed and the construction drawings prepared. This is a dream come true but we are only part way there. We need to raise the funds to build it and we need to do it quickly. We must get the dogs to this new location as soon as possible. While it is virtually impossible to get an accurate quote for construction costs in Mexico we have calculated that we will need a minimum of $37,500 US ($50,000 CDN / $750,000 MX pesos) just to construct the basic elements required to run PEP from the new location. More ongoing funding will be required to complete the other areas. WE NEED YOUR HELP to give the dogs the safe refuge they deserve and allow us to keep saving the lives of the stray dogs of Puerto Escondido, the Perros en Puerto. We are the only dog rescue and shelter in Puerto and the surrounding area, without us they have no hope. PLEASE DONATE! There is a crowd funding campaign being set up on behalf of PEP and we will share the details of that campaign here shortly. 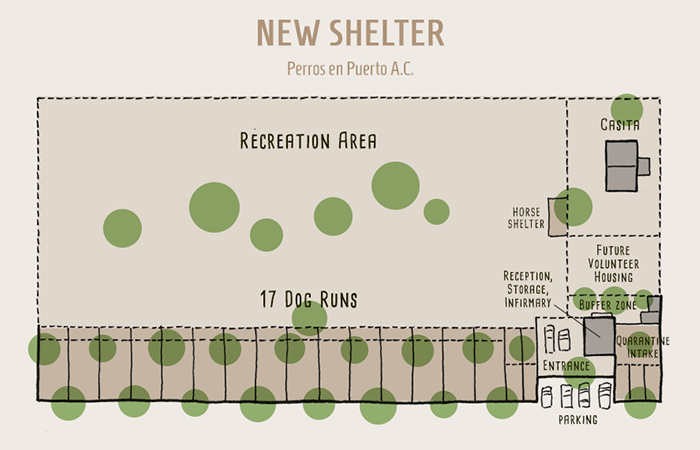 Since the first puppy and adult dog shelters were opened in early 2009 PEP has had to relocate them numerous times as they have always been constructed on “borrowed” land. Typically, in Mexico, notice to vacate can take effect within a week or less. Finding new property, constructing enclosures, installing shade cover, relocating dogs and deconstructing the old shelter within this timeframe is near to impossible and extremely stressful for Annette and the dogs but she has always managed to get it done. At present, the shelter is located on two pieces of property on the borderline of two colonias. The first part of the shelter which now has 8 enclosures is on land owned by the colonia of Brisas de Zicatela and has been in this location for over 6 years. In 2011 it was promised to PEP permanently, however, the delegado (community elected official) changes annually and permanently is at the whim of the current representative. Twice they have threatened to take back the land and it is only a matter of time before they carry through with it. Real estate prices have risen considerably and the land is far more valuable to them now than it was in 2011. The second part of the shelter which has 4 enclosures and an area for small puppies is on the privately owned land of one of our volunteers. The use of this space was to be a temporary solution in May 2015 when PEP was given three days notice to vacate the property upon which the puppy/adolescent shelter was then located. Nineteen dogs had to be moved within that timeframe and our volunteer generously offered the use of her property. It has now been close to two years and she has been waiting very patiently to build her retirement home. The first shelter which houses the majority of the dogs is constructed beside an arroyo which becomes a raging river in the rainy season. 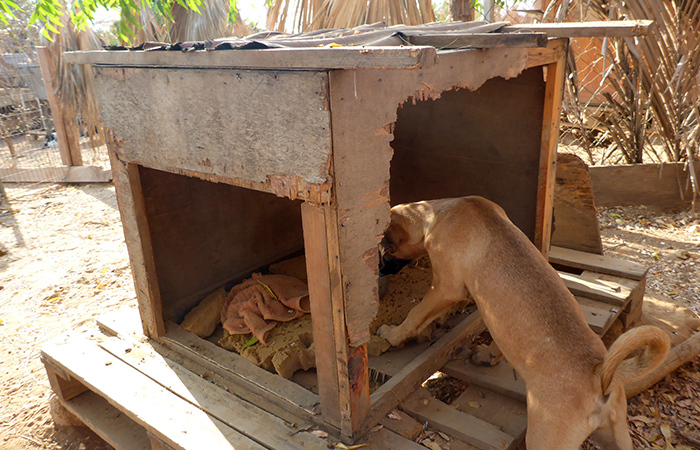 During the hurricane of 2012 PEP lost 1/4 of the land upon which three of the enclosures were built putting the lives of the dogs in serious jeopardy. Since then each rainy season has seen more and more of the land washed away. 2016 was particularly bad, fence posts had to be relocated and most of the pathway between the enclosures is gone. This year will be even worse. People are building new homes very close by and it is a common view that dog shelters do not make good neighbours. The PEP dogs do not bark excessively but, they are dogs, and will bark if strangers or other dogs pass in front of their enclosures. The more people in the area, the more likely this is to occur and more people are likely to be aggravated. Unfortunately, in Mexico, poisonings can and do occur and, although PEP does everything in its power to maintain good community relations, there is always the real and valid fear that someone could go that one step too far. More people residing in the community has, unfortunately, led to more garbage being carelessly thrown away in areas around the shelter. Garbage containing everything from dirty diapers, used toilet paper, spoiled food and plastics to toxic products. Most of the dogs are walked off leash to allow them to run, explore and play during their daily outings. This is becoming less and less feasible. Trying to stop them from eating the trash is next to impossible and, as a result, some dogs have fallen ill. Garbage is also burned in close proximity to the shelter. Not only are the fumes from burning plastics very toxic but the burning is often left unattended and the risk of uncontrolled fire is a serious one. Just a few months ago one such fire burned all night in the large field adjacent to the shelter. Firefighters did attend the fire but left before it was under control. Annette had to be onsite until 4 am, ready to evacuate the dogs if necessary. 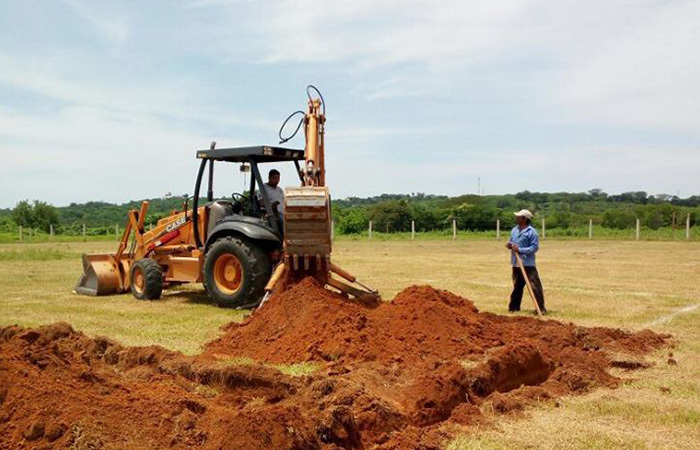 Development has also led to the construction of two additional event venues in the area. In Mexico, people love to celebrate, hold fiestas and set off fireworks or more specifically “cuetes” which are air bombs and bang rockets. Air bombs have been banned in many countries for noise and safety reasons but are still commonplace in Mexico. There can be several of these celebrations each month and more during holiday seasons. This causes the dogs untold stress and puts them in danger. Some dogs will do anything to escape, some shake violently with fear and some dogs, who peacefully coexist in their packs, can become so stressed that they will fight with their packmates. Trying to calm down 60 to 70 dogs during these times, often in the middle of the night, is a daunting task and a number of the most fearful need to be kenneled for their own safety. As the shelter has always been on borrowed land, construction has had to be of a temporary nature. The use of proper concrete structures did not make sense from a financial or practical standpoint. When necessary the structures needed to be able to be disassembled and moved and the property left as it was found within a very short timeframe. The existing enclosures are constructed from wooden fence posts and chain link fencing. Both the fence posts and the bottom of the chain link are buried in very sandy soil and are reinforced with wooden planks in an effort to prevent the dogs from digging out under the fence. However, termite damage is a major problem as is the tropical salt air which is very hard on both wood and metal. Even the coated chain link erodes in a very short time. And then there are those few dogs whose greatest pleasure is escaping their enclosures. They never go anywhere, just out to prove they can! They chew holes near the bottom of the chain link or even manage to dig their way out under the planks. The constant maintenance of these structures is very labour intense and costly. With 60 to 70 dogs to care for morning and evening this work must take place during the hottest part of the day. Even with regular maintenance the shelter would need a major renovation in the very near future. 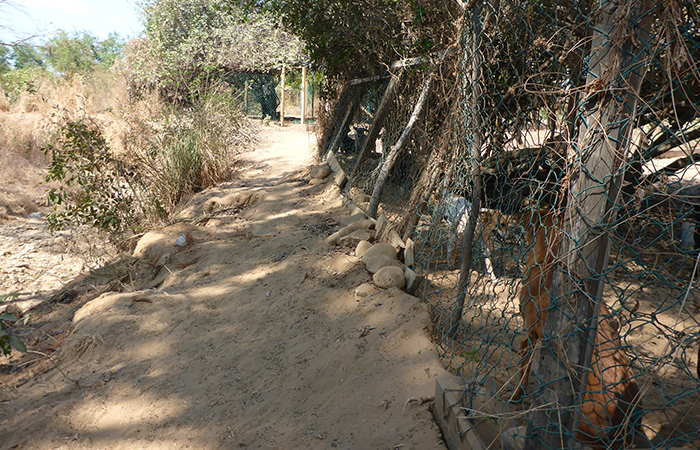 The current shelter has no facilities for the quarantine of newly rescued dogs, dogs in recovery or very young puppies. In the past Annette has looked after these dogs at her home, however, for the past two years she has been in a rental that only permits her to have one dog. Due to circumstances, she has not always been able to comply with this condition of tenancy and it has been very stressful. The rule was just enforced within the past month resulting in a scramble to find housing for 2 adult dogs and three puppies. She was given one hour to relocate the dogs or pack her things and leave immediately. The problem is Annette must live within earshot of the shelter and there is very little rental accommodation in the area and none presently that allows more than one or two dogs. The land is in a perfect location. It took a lot of searching to find the right combination of remote quiet area and proximity to town and this is it. The land is in an established agricultural community surrounded by farmland and there are no houses nearby. It is only 10 minutes or less from the main road through Puerto Escondido and within 15 minutes of the vet clinic. It is close enough to town to respond to emergency calls and rescues and is serviced by public transportation so easily accessible for volunteers. For those wishing to adopt or visit the shelter it is very easy to find. The land is level and has been cleared ready for construction. The shelter will be located at a good distance from the only road in the area which has very little traffic. The planned shelter will house up to 60 adolescent and adult dogs and up to 10 or more small puppies in a series of 17 enclosures. 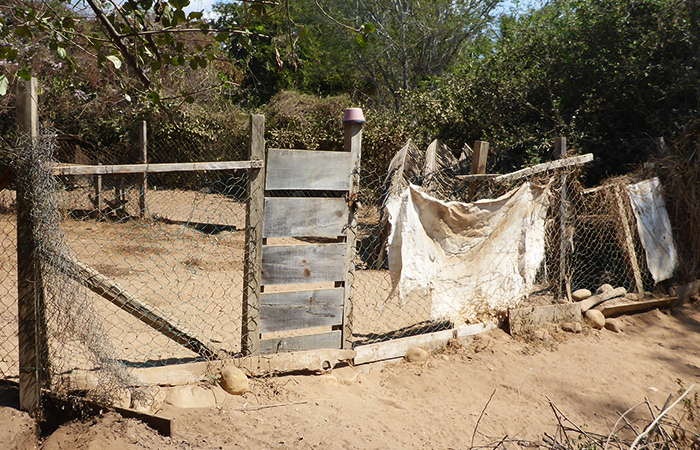 The 6 oldest sanctuary dogs will live in the garden of the small casita where Annette will reside. There is a provision for emergency overflow in the plan and there is space to expand the shelter in the future if necessary but the goal is to keep to the currently predicted maximum number of dogs at any given time. All the dog enclosures will open directly out to a fully fenced, supervised recreation area measuring 85m (280 ft.) x 36.5m (120 ft.) which will also give the two shelter horses lots of room to stretch their legs. A building with a covered outdoor reception area will serve as a storage facility and will also house the infirmary and treatment center. Adjacent to this, well separated from all the other dog enclosures, will be three quarantine runs with a dedicated, fenced outdoor area for newly rescued and/or sick dogs. And finally, there is a designated area in the plans to allow for the future development of volunteer accommodations consisting of two private rooms and a communal kitchen area.